Caelira is a land besieged by powerful storms and people's only hope of survival is to band together in towns protected by Stormlings, powerful magic wielders who are able to keep those storms at bay. As the princess of Pavan and heir to the throne it is Aurora's job to keep her hometown safe but even though she's from one of the most powerful Stormling families she has never been able to use magic against even the weakest storm. The queen has managed to keep Aurora's lack of magic a secret but in order to protect the future of their city she has arranged a marriage for her daughter to a powerful Stormling prince from a neighbouring kingdom. At first Aurora is resigned to the idea of marriage but the more she learns about her future husband the more she fears for her future. When she discovers that there may be a way to earn the magic she needs to protect herself and her city she knows she has to risk everything to follow her dream. If only she can be brave enough to face the storms she might be able to learn to control them. 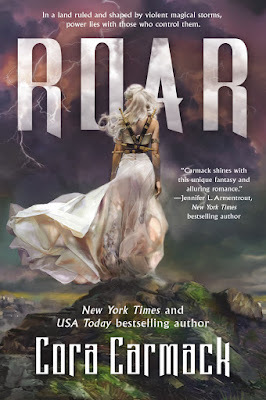 As a fan of Cora Carmack's new adult romances and a lover of YA fantasy I added Roar to my wish list as soon as I heard about it. I was curious to see how she would do witting such a different type of story and I have to say I was really impressed. I'll admit I was a bit nervous when we were given not one but two serious cases of insta-lust in the early chapters but I was already hooked enough to look past that and I'm very glad I did. While Aurora does have a strong attraction to two very different guys thankfully the whole book doesn't revolve around a love triangle and there is much more going on than meets the eye. When Aurora, or Roar as she comes to be know as, leaves everything she knows behind to go with the Storm Chasers she quickly starts to come into her own. In some ways she's led a very sheltered upbringing and is naive to the way people live outside her city but she's been trained from a young age to be a queen so she has a lot of knowledge and she's a very fast learner. She's also determined, she doesn't want to fail her queen or her people and she fights hard to be accepted by the Storm Chasers so that they'll teach her how to master the storms. No matter what challenges are thrown at her Roar never gives in and I really admired her spirit. I also loved the Storm Chasers, they're a diverse group who have been together for a long time and work really well together. They're a well oiled team and some of them aren't too happy about adding a new member but they gradually come to respect Roar as they spend time together. I loved the banter between the whole group and the brotherly bond between Locke and Ransom. I'll tell you right now I'm totally on Team Locke and I'm going to be seriously unhappy if a love triangle forms in the sequel! Although the attraction between Roar and Locke is pretty instant it takes time for them to open up to each other and become friends let alone anything more than that. There is lots of delicious flirting and they spend a lot of time at loggerheads but the chemistry is there right from the beginning no matter how hard they both try to deny it. Locke is that great kind of hero who is able to put is protective instincts to one side and help the heroine learn how to look after herself, he trusts Roar to hold her own and follow his lead in dangerous situations and allows her the freedom to make mistakes when her life isn't on the line. I think they make a fabulous couple and I'm definitely rooting for them even though I was disappointed that Roar wasn't more honest with him and the rest of the group a little earlier in their journey. Obviously I love the characters but it was the world building that fascinated me most in this story. The idea of storms being practically alive and of being able to tame them by stealing their heart was totally unique to anything else I've read and the scenes where the Chasers are facing tornados or hurricane winds were incredibly well written. The plot is much more complex than you first think too, there are a lot of hints and I'll admit I guessed a few of the twists before they happened but there were plenty of surprises along the way and I'm definitely curious to see how things progress in the next book. 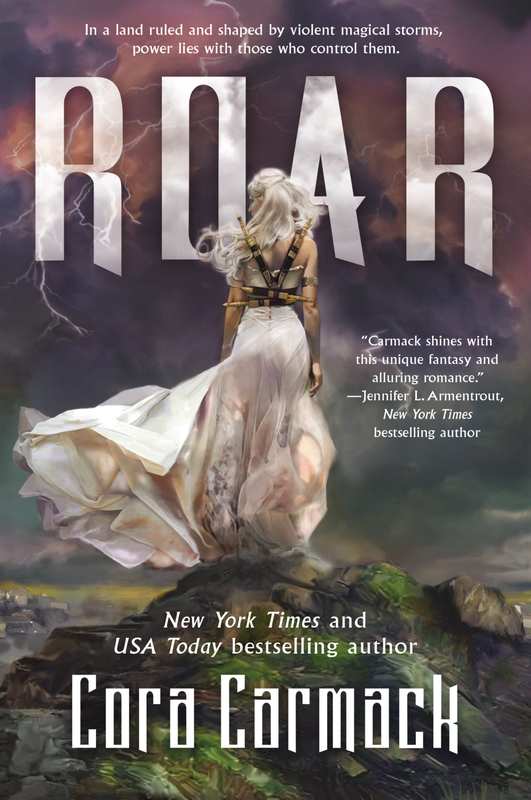 Roar totally lives up to it's stunning cover and I can't wait to spend more time in this world.